The photograph is taken from the window of the Senior Researcher for the newly established Commission for the Fight against Genocide. John, the researcher gave us a two hour presentation. 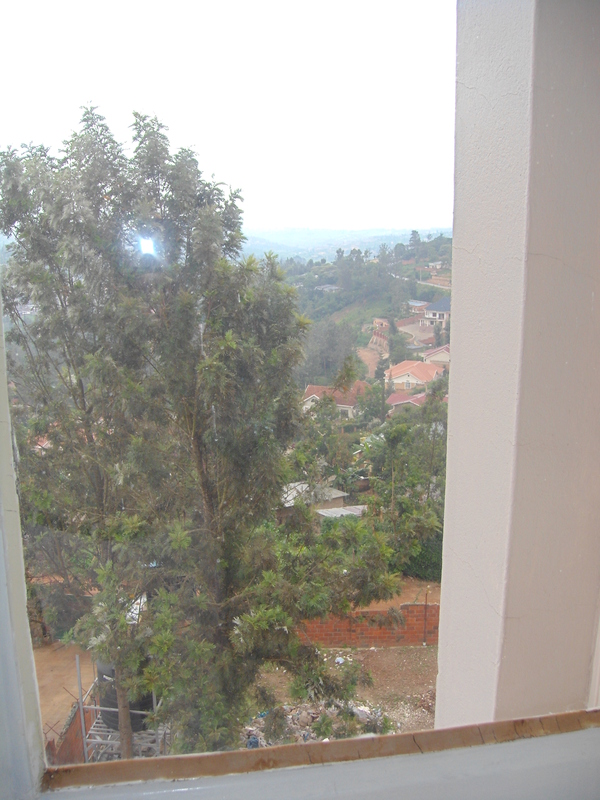 The first hour was an overview of the history of Rwanda. There is no doubt that the colonial legacy contributed greatly to the genocide which this country experienced in 1994 when up to one million people were murdered in a most callous fashion. Most were hacked to death by people wielding machetes; women were raped and those showed any compassion were murdered as collaborators. The second hour looked at the work of the commission and a little from John’s own story. The genocide is never far from the surface here. John explained that he was studying in Geneva when the genocide started. His mother, father, two brothers and two sisters were murdered. Like many here he spoke with little emotion; he was merely sharing his own story. A number of years later he returned to find the remains of his family. In Ireland there are many reports from families who wish to find the remains of their relatives who were killed in the troubles and reports are that the remains can’t be located. The remarkable thing about John is that he located the remains of his family within days. Having received the information he set out one morning with a truck and by one o’clock he had exhumed the skeletal remains of his family. One lady was able to tell him exactly where his mother was buried, Standing int the ladies back garden he asked ‘how do you know that this is the spot’. She said, ‘my husband killed her, I was here when it happened’. His mother had come to their door looking for a glass of water having been in hiding for days on end. ‘Where is your husband now?’ asked John. ‘In the Congo I believe but to be honest I don’t exactly know’. Like many associated with the genocide he fled to another country. She is one of the many widows on the Hutu side. The genocide was a well-orchestrated event. It was not a sporadic bout of madness but the work of a militia who terrorised local areas as they sought to wipe out the Tutsi population of Rwanda. The event was in the planning for at least four years. The history of this ethnic cleansing is not something that was born in centuries past; the first reported killing of a Tutsi by a Hutu for reasons of race was on the 25th of July 1959. There is a lot more to say; a lot of conversations had today as we unpack this horrific event. I am here with a couple called John Bosco and his wife Christine. Along with a team sponsored by Notre Dame University we are journeying with them as they try to unpack their horrific experiences in the genocide. They are an amazing couple whose love for one another is beyond question. They were engaged to be married just before the genocide. When the genocide broke out John Bosco put life and limb at risk to protect his future wife. Hopefully I can give you an insight into their story over the next few days. My luggage was lost in transit. I didn’t loose the head over it. I just thought of some the stories from the genocide that I am familiar with when people like John lost a lot more than a few possessions. My little mishap reinforces one certainty; these amazing people have a lot to teach us ‘westerns’. Maybe next time I’ll share the conversation about suicide that I had with John Bosco and a nun earlier today.